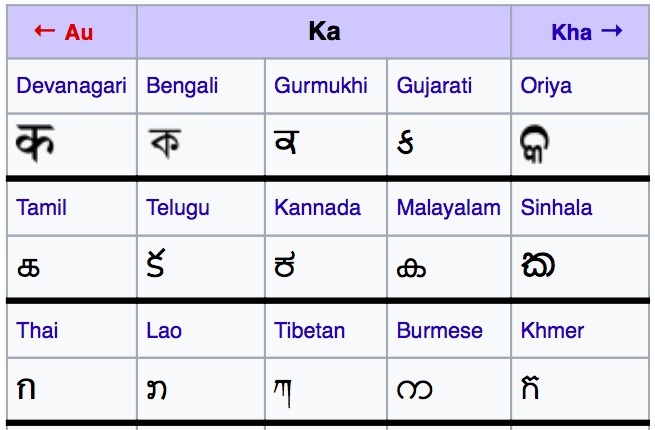 Ka (क) is the first consonant of the Devanagari language. The letter can be traced back to the Brahmi letter (ka). Brahmi script is the oldest writing systems used in South and Central Asia from the 1st millennium BCE. The letter later transformed into the present form of Ka. क् + ष(ʂ) become a new letter क्ष (kʂ). ङ्(ŋ) + क can be written as “ङ्क” but, traditionally it is written as a vertical conjuct ŋk, placing ङ above the क. क् + ख(kʰ) gives us kkʰ with the क placed above the ख. क् + ल(l̪) gives us kl̪ with the क placed above the ल. क् + व(ʋ) gives us kʋ with the क placed above the व. क् + न(n̪) gives us kn̪ with the न rotated and placed under the hook of the क. Like all other letters, Ka letter in conjunction with the twelve vowels result in twelve different sounds like ka, kaa, ki, kee, ku, kuu, ke, kai, ko, kau, kam, kah.